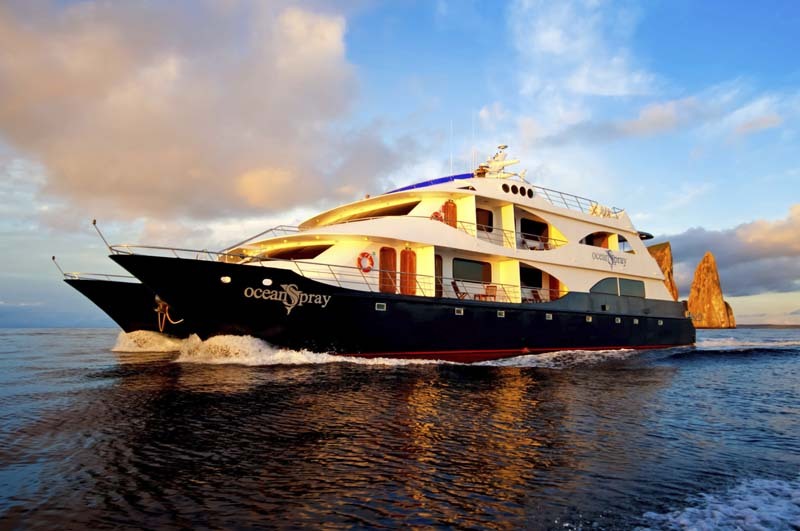 A cruise is the ultimate way to experience the Galápagos Islands. Climb aboard a luxurious yacht, often complete with an upper level jacuzzi, sun loungers, and fully stocked bar, and leave your worries on the mainland. Prepare to immerse yourself in a world of weird, wonderful, and often extremely playful creatures that cannot be found anywhere else on Earth. This is a once-in-a-lifetime trip, allow us to help you make it absolutely unforgettable. This is an 8-day itinerary, the most common amount of time that people spend in the Galápagos. However we also offer cruise itineraries as short as 4 days and as long as 15 days. Catch a morning flight from Quito to Baltra Island, one of two islands in the Galápagos that have airports. Yacht staff will meet you at the airport and transfer you to the boat, anchored just off shore, to begin your cruise. Store your luggage in your cabin as you begin your journey, starting with a stop at Isla Lobos, named for the sea lions that live and play on its rocky shores. Next you will visit Kicker Rock, a striking formation that juts hundreds of feet up out of the sea. Visit Pitt Point and Cerro Brujo (Witch Hill) on San Cristóbal Island. Pitt Point is known for being one of the few places in the archipelago where you can see all three species of boobies, Nazca, red-footed, and the crow favorite, blue-footed boobies. Cerro Brujo’s stunning white coral beach might have given rise to the name Witch Hill for its bewitching beauty. Travel back in time at Post Office Bay on Floreana Island, a makeshift post office that started off as nothing more than an old wine barrel, and has now become a quasi-functioning post office. Many tourists continue to leave letters or postcards to send home. In the afternoon you will get the chance to dive in at the Devil’s Crown, a sunken volcano crater that makes for one of the best snorkeling spots in the archipelago. Day four is many of our clients favorite days, combining great wildlife viewing with stunning scenery. Black Turtle Cove is surrounded by mangrove trees which provide a protected habitat for a wide variety of marine life, from hammerhead sharks to sea turtles. In the afternoon you will get a chance to take a picture at the iconic Pinnacle Rock, one of the most photographed parts of the Galápagos. Genovesa Island is a haven for a wide variety of bird species and it is easy to see why as you climb the Prince Phillips Steps. This steep winding staircase climbs up a high cliff face and ends at the penthouse nesting floor with birds eye views over the island. Start your exploration of Santiago Island at Espumilla island, one of the best places to see marine iguanas. These iguanas have adapted to be able to dive up to 20m in search of algae to eat. In the afternoon sail into Buccaneer cove, a historic haunt of pirates, marauders, and sea turtles. The tiny island of North Seymour is known for its arid landscape and vegetation but, fear not, you will still get to seymour amazing wildlife! When you reach Santa Cruz island you will journey up to the forested highlands and get to see many Giant Galápagos Tortoises, both in the wild and at the El Chato Tortoise Reserve. Your last day in the Galápagos starts early with a visit to Mosquera island, only 160m wide at its narrowest point. This island has lots of coral and rock reefs surrounding it which draws in all manner of fish, crabs, birds, and marine mammals. If you are lucky you might even catch a glimpse of orcas hunting in the deeper waters offshore! The yacht will then finish its cruise circuit back at Baltra Island in time for a mid-morning flight back to mainland Ecuador. From there you can catch a flight home, or on to your next adventure! You do the dreaming, we take care of the rest. Send us an email or call us to get started planning your dream adventure in this amazing location now!